German-engineered, this audio cable is manufactured to provide you with the maximum signal-quality and durability so you can experience exceptional sound-quality. 99.9% high-purity, oxygen-free copper wires provides maximum conductivity, resulting in a higher quality of sound. And because they're oxygen-free, you'll experience that pure sound for years as the wiring won't lose performance due to oxidation. 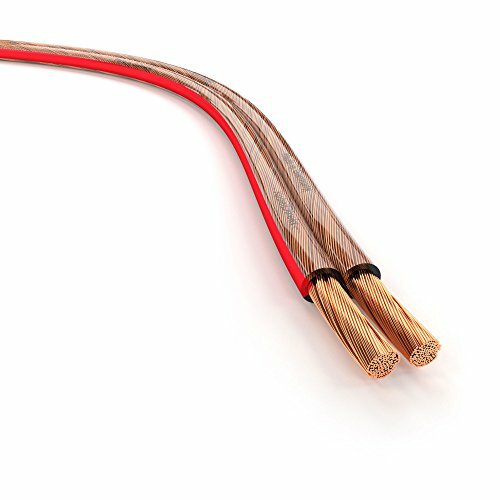 So you don't have to worry about damaging your home entertainment's performance, we've constructed your speaker cable with a robust PVC and clear polarity markings. Making it super easy to install correctly. AWG (American Wire Gauge), refers to the thickness of copper wire in your cable. The lower the number, the thicker the wire. - If you have normal 8-ohm speakers, at a normal distance, and you're a casual listener, KabelDirekts 16 AWG cable will suit your needs. Every speaker cable is manufactured in Germany according to RoHS and ISO guidelines, so you can be 100% confident you're getting a top tier cable. We're so confident you'll love the results, we'll give you 18-months warranty. If you have any questions about this product by KabelDirekt, contact us by completing and submitting the form below. If you are looking for a specif part number, please include it with your message.